Discussion in 'Amps and Cabs' started by Bucksears, Apr 18, 2016. My Super Reverb head is going in for surgery over the next couple of weeks to replace the OT with one that has 2/4/8ohm taps. Doing this to give me more speaker options than the stock 2ohm output offers. The G12C pair would yield the American tone, probably closest to turning my Super into a 50W Twin. But thinking about something with more mids to bring a fuller sound in that regard. Not trying to turn it into a tweed Bassman, but would like it if my dirt pedals didn't have to work as hard to fill in the midrange. Any opinions on the Vet30 combinations above? I use Weber Legacies in my '66 Pro Reverb. They're Greenback-style speakers that handle 65 watts, have a light magnet, one with a 75 hz lead cone and the other with a 55 hz bass cone. They soften the sometimes overwhelming bass and provide more emphasis on the mids which are notoriously lacking in BF amps. I like them a lot, though I play dirty and straight in about 70% of the time and almost never play completely clean. I think the Invader is the closest WGS equivalent. Edit: I've got an ET65 in my Supro Dual tone, and I like it in that amp but I wouldn't put them in the Pro because they're too scooped. That might be the goal of someone who wants the traditional BF sound, but I was going for something different. If you're looking for more mids, I'd go with two Vet 30's. It's a great speaker and sounds fabulous with BF Fenders. Next would be a mix of ET65/Vet30. I like that pairing and it's one of the more popular pairings out there. The only issue I had with running the ET65/Vet30 pairing was that whenever I'd EQ in the Vet 30, the ET65 would sound too dark. When I'd EQ the ET65, the Vet 30 would be way to harsh and brittle. I ended up running two ET65's in my 2X12 and am very pleased with the tones. Assuming the mids are tamed down compared to a Vintage30, how are the highs and lows? The lows are pretty dang tight and the highs are very nice and smooth. They've taken that insane high-mid spike out of the Vet 30 that is in the V30 and you can really tell the difference. The Retro 30 is really punchy in the lows and the highs are not shrill at all, but they let you know they're there. I believe WGS gave the Retro 30 more of the V30 DNA. Here's the big thing for me and speakers with BF Fenders and bright switches. I've found that if I like to run with the bright switch "ON" then I want a speaker that is a little warmer so that I don't get that high fizz when I use overdrive pedals. If I'm using speakers with accentuated highs and high-mids, I feel like the excessive treble brings on a ton of problems. If I ran my amp with the bright switch "ON" most of the times, I'd go Vet30. If I ran with it "OFF" I'd go with the Retro 30. That's just me I guess. I'm a HUGE fan of Vintage 30's in BF/SF Fenders, they just kill. I've run them in Bassman, Twins, Pros and currently in my '71 SFDR. Go with the Veteran 30's. Heady Jam Fan, RussB and MissoulaGriz like this. Greenies and a Bassman type amp is a beautiful thing. Oh, and in my experience, a Vet 30 and a good V30 are worlds apart. I use a pair of reconed Celestion G10S-50's with my '63 BF Tremolux. It's a beautiful thing. I think I'm going to go with a pair of Vet30s and start from there. Creamback M's sound great in Fenders. I'll also cast my vote for V30's. Some of my favorite speakers. I installed an Senn e906 mic in my V30 212 and it sounds awesome! Mixing speakers can be cool, but sometimes I find that the EQ on the amp ends up being a compromise between what is ideal for the two different speakers rather than what is ideal for either speaker. I generally stick with 2 of the same speakers, but my favorite speaker to pair with the V30 is the Gold. WGS makes a version, but it is still pretty pricey. The Eminence Red Fang is a bit cheaper and goes great with a Bassman. Wow, so, you've got a Mesa Mark (II? III?) running into a cab with V30s, AND you've got a pair of TS9s into all that. I'm guessing you like midrange. I dig the 9-series thing you've got going on that board. I'm agreed on the whole mixing speakers idea at this point. It's like trying to balance three different EQ sources vs two. Yeah, I dig the midrange . Its a Mark III Red Stripe. I've been a bit of a speaker junky and I always go back to V30's. 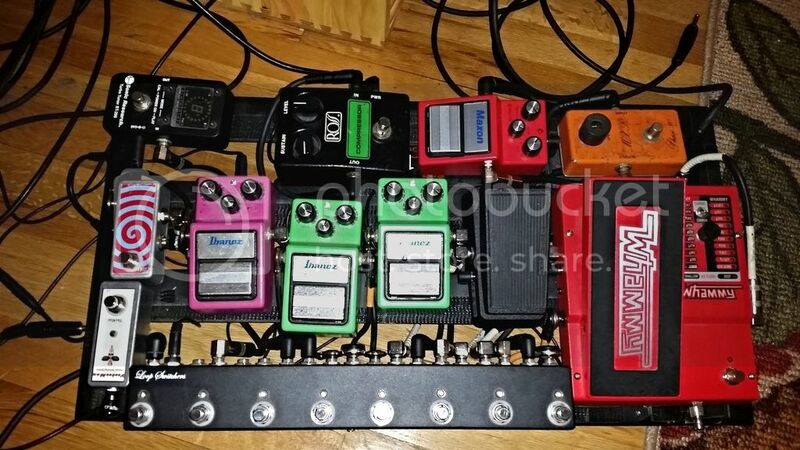 I'm a huge fan of the 9-series Ibanez pedals. If I had more cash, I think I'd get a full collection of the originals from the 80's. I just sold a GE9 and I'm selling a CP9, I also used to have an AF9. Those TS9's are 82 and 83, but the 9-series on the top of the board is a Maxon CP9Pro+ that I used to add some fullness to my cleans and bring them up in the mix. You can't beat the AD9 for that classic analog delay. I'm running that through the effect loop just along with the lead channel (hence the lead footswitch close enough to the single TB loop for the AD9 so I can stomp both at the same time). I have a Mesa Mark IV and have used a EV and a Veteran 30. With the cabinet I have the Veteran 30 seems to breathe more, not sure if it was tube related however as I found a phase inverter tube which really brought something to the otherwise notes which seemed to trail off into nothingness. Now the notes have more "Krang!" to them and ring out better. Regarding midrange content, they don't seem too honky, it also is important that you use bright and clear 12ax7 tubes. JJ's will tend to make it too middy, especially the clean tones. I don't know about JJ's. I use Ruby tubes in my Mesa. But I agree that its not honky. I even boost mids/trelbe on my lead channel (see the GEQ). The H magnet on the V30 provides plenty of punchy depth to balance the mids, while I personally find Celestions with the M magnet to be a bit honky / anemic in the bass. 50oz is the perfect amount of ceramic per speaker IMO. I've also used an EV many times and I keep selling them to go back to V30's: because of the weight, cost, and the EV's bass extends too low and always sounds a bit muddy to my ear. The Celestion sounds more interesting and present/clear. But since the OP is interested in Fender amps - this also applies IMO. I has a Red Fang in a Blackface Bassman that I put in a 1x12 combo and it sounded great. I also used a Blackfaced Deluxe Reverb for years and I liked Gold-type speakers with that as well, but most recently I used a Steamboat Hemp 100 (like a G12-80 / C90 with a Tone Tubby Cone). I prefer to fill in the mids a bit rather than using an American speaker. I have a blackface Dual Showman. 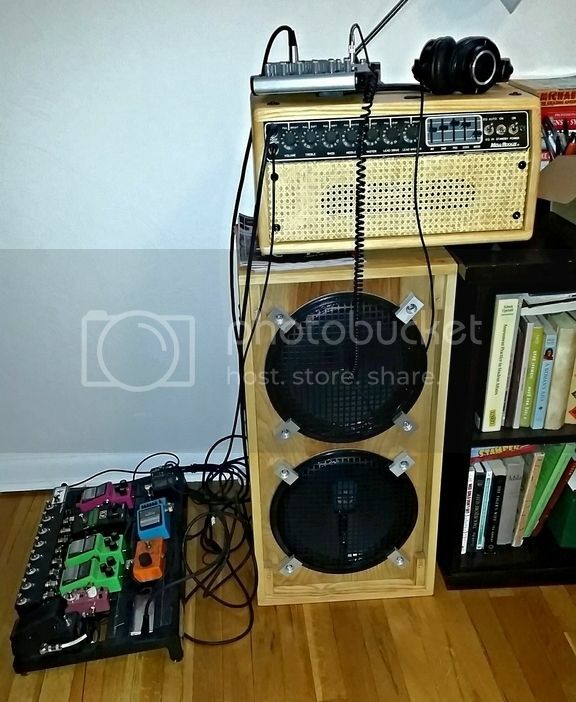 I use a 2x12 with it filled with Eminence speakers. Cannabis Rex on one side and a Wizard in the other. It's designed to project but alter the overall frequencies to get around some of the "Fender"ness. Wizard gives more mids and the Cannabis Rex helps to soften some of the intense highs. Celestion V-Type. A cross between a V30 and Greenback. Stock speakers in the new Fender Custom and Bassbreaker series. I have a 60s Fender cab that I put two greenbacks in. Sounds awesome with my 68 bandmaster and sounded awesome with my 66 bassman.